You’re walking along a wooded road or a forest path in early spring and off to one side, you hear ducks quacking. Dozens of them, chattering away. You look, but there are no ducks in sight, though there is water. But if you look closely, you’ll see small, brownish frogs. Those are your quackers: You are hearing the chorus of spring mating calls of the Wood Frog. These hardy amphibians crawl out of the earth as soon as the snow melts and the ground thaws. They head for the nearest water, usually a vernal pool surrounded by woods. There they mate and their eggs are deposited underwater. 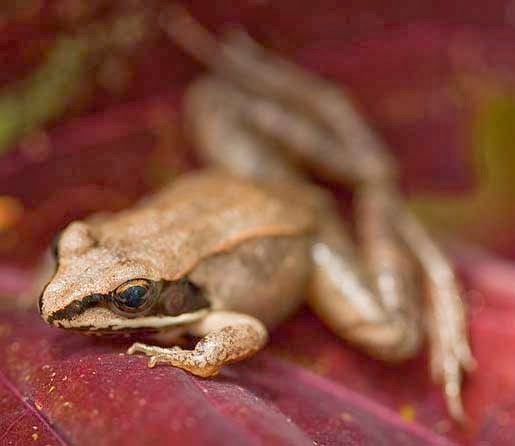 Vernal pools provide ideal mating grounds for these frogs and Spring Peepers. These ephemeral waters have the advantage of being around in the spring, but are usually gone by late summer. Consequently, they can’t support fish, which would eat the frog eggs and tadpoles. And they last long enough to allow eggs to become frogs. Scientists say many amphibians seem to be in decline. The good news about Wood Frogs is that their populations appear to be in good shape, even increasing, especially as the former farmlands of our region return to forest, allowing for more vernal pools. This trend could continue, as long as wise land-use officials see the life-giving value of vernal pools and protect woodlands in which they appear.